You might never have painted a picture of yourself, but you’ve probably taken a selfie. You could see selfies as a modern form of the self portraits that artists have been making for centuries. They used them to explore their identity and to express something about themselves or their status. The Dutch artist Rembrandt van Rijn famously created almost a hundred self portraits during his 63 years – over 40 of them oil paintings. Very few artists painted so many throughout their life, from youth to old age. You can almost watch him grow up through his art. Rembrandt’s self portraits can be divided into three broad phases. He first used them to study his own facial features and expressions, later to advertise his skill, and then in his last years to create art of self-scrutiny. The rapid sketch in pen and brown ink is one of Rembrandt’s first self portraits, made when he was around 22 or 23, and the etching is from 1630, when he was 23 or 24. Both have a vivid immediacy. 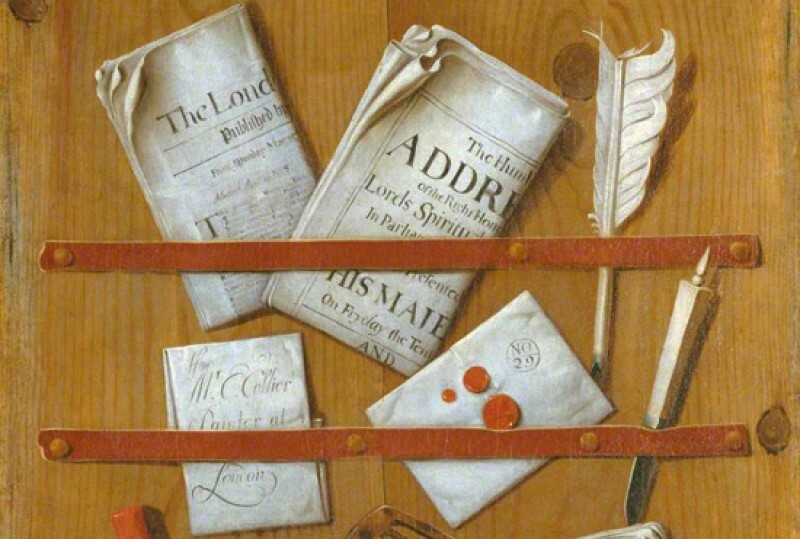 This painting dates to around 1630, when the artist was 24 and fresh faced. In all these early works, Rembrandt was not just interested in his own features for his own sake – he was using self portraiture to understand and reproduce a wide variety of feelings and emotions. In 1631 Rembrandt moved from Leiden to Amsterdam to work for the influential art dealer Hendrick van Uylenburgh. 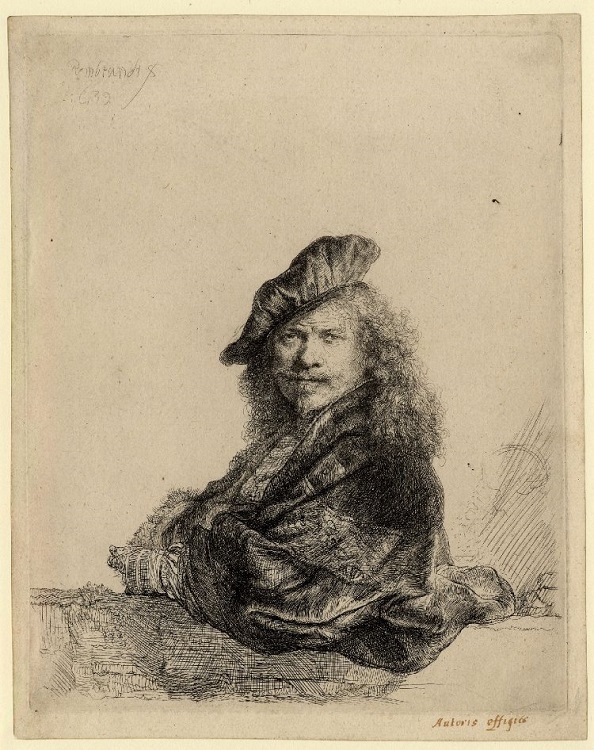 He was conscious of the fame of his fellow Netherlanders Rubens and van Dyck, and in this etching he has adopted the pose and hat of a Rubens' self portrait (particularly of the Pontius engraving after it). He is wearing highly fashionable clothes, but the lace collar and cloak, signature, date and age were added by Rembrandt in black chalk in around 1633 or 1634 (this is why he has changed his age from 27 to 24, as he was in 1631). The black chalk addition on the etching dates from the time he was working on this painted self portrait, now in Glasgow’s Burrell Collection. The painting is dated 1634 and its composition, with the hat and lace collar, is similar to the earlier etching. In 1634 Rembrandt married Saskia van Uylenburgh, the niece of Hendrick van Uylenburgh and daughter of the burgomaster (mayor) of Leeuwarden. She brought Rembrandt a great dowry, which in the short term meant he did not have to worry about money and could concentrate on art – he became the greatest portrait painter in Amsterdam during the Dutch Golden Age. This rather splendid self portrait is from the period directly after his marriage. It is a great example of how Rembrandt often dressed in exotic clothing or clothes from earlier times. 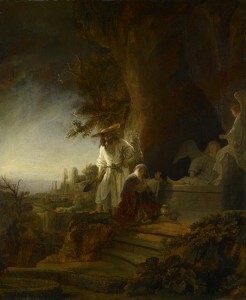 Acquired as a genuine Rembrandt, in 1968 it was suggested that it was not authentic. 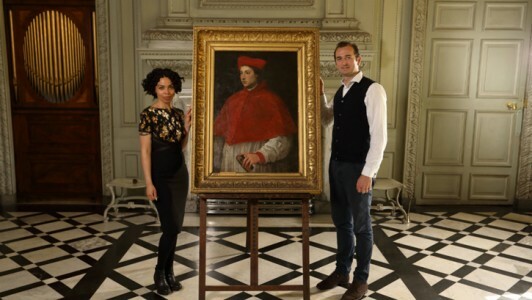 After much scientific research in the past ten years, it has been reattributed to the master, and is one of the jewels of the National Trust’s collection, usually on display in Buckland Abbey in Devon. Another Rembrandt that has had doubt thrown on its authenticity is this self portrait in the Wallace Collection, where the artist wears a black beret and a fur cloak. The portrait was painted on a panel from the same tree as a self portrait by the artist of 1634 (now in Berlin). The panel was heavily cut after the portrait was painted, probably in around 1837. 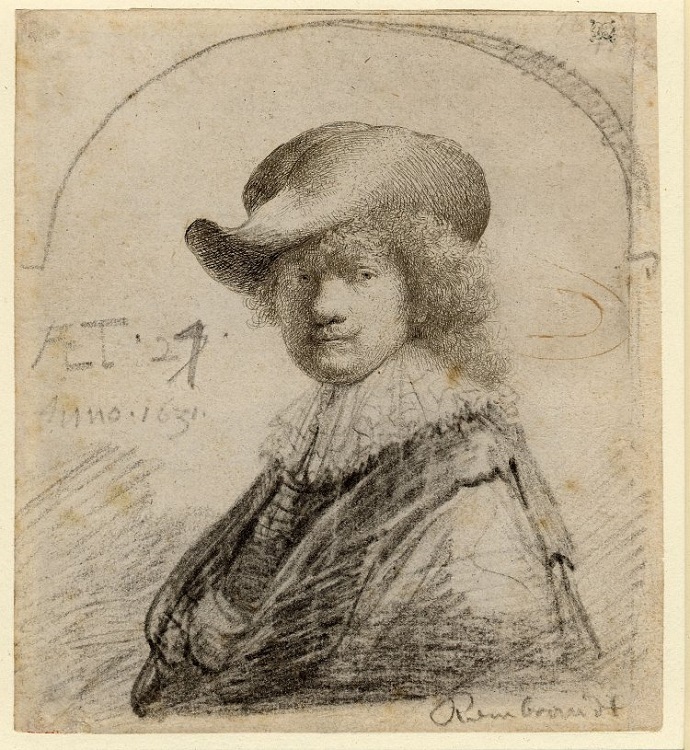 After further research, it is now once again regarded as an autograph work by Rembrandt, although the signature might have been added by a member of his studio. 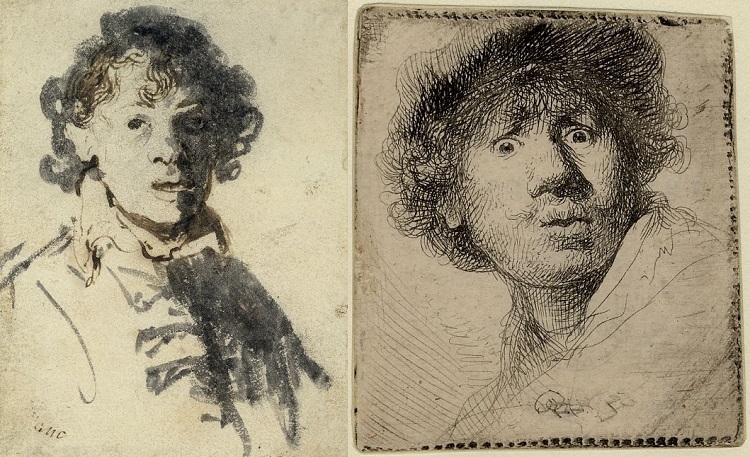 These self portraits – an etching from 1638 and a painting from around 1640 – show Rembrandt at the height of his career, presenting himself in a self-assured pose wearing an elaborate Renaissance costume in the fashion of the sixteenth century. Rembrandt took inspiration from two sixteenth-century works, Raphael's Portrait of Baldassare Castiglione, now in the Musée du Louvre, Paris, and Titian's Portrait of Gerolamo (?) Barbarigo, now in the National Gallery, London. In Rembrandt's day, both these paintings were owned by an Amsterdam collector, Alfonso Lopez, and were widely known. Just as he had earlier taken inspiration from Rubens, Rembrandt probably wanted to be seen as Raphael's student and artistic equal – a true Old Master. Rembrandt’s personal life took a downturn in the late 1630s and early 1640s. Saskia and he had four children, but three of them died shortly after birth. Their surviving son, Titus, was born in 1641, but Saskia died in June 1642, aged just 29. Geertje Dircx was hired as Titus' nurse and also became Rembrandt's lover. She would later charge Rembrandt with breach of promise (she claimed he had promised to marry her), when he began a relationship with his maid, Hendrickje Stoffels. Rembrandt and Hendrickje had a daughter, Cornelia, born in 1654. However, they could not marry as he would have lost access to a trust set up for Titus in Saskia's will. To continue the soap opera, Rembrandt was living beyond his means and was declared bankrupt in 1656. Titus and Hendrickje were forced to administer the production of his etchings and the sale of his pictures, in 1658. Both Hendrickje and Titus were to die before Rembrandt – Hendrickje in 1663 and Titus in 1668, aged just 26. This portrait from the collection at Kenwood House belongs to the last category of Rembrandt’s self portraits – the ones of self-scrutiny. It was made in the 1660s – in the last five years of his life. This is not a youthful ‘selfie’. It is possibly unfinished – it is not dated or signed, the paint is loose and experimental, the hands are half-painted. There is a mysterious background, with two partial circles – maybe he is painting a new canvas. You can compare the Kenwood self portrait with another late work in the National Gallery. Aged 63, this self portrait was one of his last pictures. So what is he trying to say in these works? Rembrandt’s personal circumstances perhaps give us a clue. In his 30s, he was the greatest portrait painter in Amsterdam. By 1657 he was insolvent, and spent his last decade (when these paintings are from) in poverty and isolation. But here Rembrandt positions himself as the heir to the great painters of the past – in particular Titian, once again, in the Kenwood House portrait. So this is an artist speaking directly to posterity – showing that although his life may end soon, his art will stand forever. Find out whether this self portrait turned out to be a genuine Rembrandt on the latest series of BBC Four's Britain's Lost Masterpieces.